When the phrase “an amazing multi-tasker” is used, I tend to think of a modern-day superwoman. You know who I mean. That amazing woman who always manages to not only land the big accounts at work, but also have a nutritious, delicious, home-cooked dinner on the table every night, plus organize her family into picture-perfect snapshots for each and every holiday. To be honest, I was never a fan of that woman. However, Eileen Cook brings it all into focus and is actually a real-life multi-tasker that I can appreciate and look up to. With eight books under her belt (one of which has been optioned by a producer to become a movie), she just doesn’t quit! Her novels appear in six different languages, they cross genres (she’s written kids book, YA, and chick lit), and she has another job in addition to writing!!! Her latest novel, "Unraveling Isobel," was published earlier this month. She lives in Vancouver, Canada with her husband and two dogs. 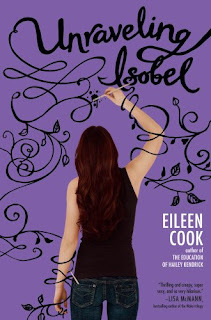 Eileen is giving away TWO copies of "Unraveling Isobel" to some lucky readers anywhere in the US or Canada. You can find out more about Eileen by visiting her website, as well as her Facebook and Twitter pages. I am a huge reader. I always have stacks of books around the house. I also have a yarn addiction. I learned to knit a few years ago and I enjoy playing with the different colors and texture. After spending a day making things up, it's nice to do something with my hands. Some days you can spend hours writing and not have much to show for it, when I knit at least I end up with a sweater or a sock. (sometimes a misshapen sock, but it is a sock). I do my best creative writing in the afternoon. I use the mornings for edits, research, answering emails, and the occasional random internet surfing. (Hey, I have to keep up my celebrity gossip somehow) Although I love the idea of having a set schedule, my life sometimes gets in the way. I set a weekly word count goal. Some weeks I get most of that done in a couple days, sometimes it is just a little bit each day. Do you base your characters on yourself or people you know? Without giving anything away, what is your favorite part of "Unraveling Isobel" and why? My favorite part of the book is watching Isobel trying to determine if she is seeing ghosts, or if her sanity is slipping. I wanted her to be unsure what is happening, but also leave the reader feeling uncertain and second guessing themselves. In one sentence, what was your journey to publishing like? Frustrating, exciting, and scary. This isn't an easy business, you have to be determined and it doesn't hurt to have a great group of friends to support you along the way. If "Unraveling Isobel" were made into a movie, who would play the lead characters? I am terrible at casting because I want to put Colin Firth in the movie, not because there is a part for him, but because I want to meet him. I'd also give Johnny Depp an audition so he didn't feel left out. I would consider casting all new actors because it is always nice when you watch a movie and aren't automatically thinking of what other movies they have been in. What two books have you read recently that have made you laugh? I read "I Think I Love You" by Allison Pearson and "The Name of The Star" by Maureen Johnson. I met my best friend Laura in seventh grade. She was the exotic new kid from the "big city." Anything compared to the town we lived in was the big city. We're still very close friends and talk on a regular basis. My earliest childhood crush was Scott Baio. This is sort of a shame because he's sort of a slimy character now. In high school I had a crush on John Taylor from the band Duran Duran. I think it is safe to say my taste in men evolved as I went along. What month are you looking forward to the most this year, and why? I always love March because my birthday is that month and this year I'm hoping to get out to New York City for a visit. Anytime I can go to NY it is a good thing! Special thanks to Eileen for answering our questions and sharing her book with our readers. 1. 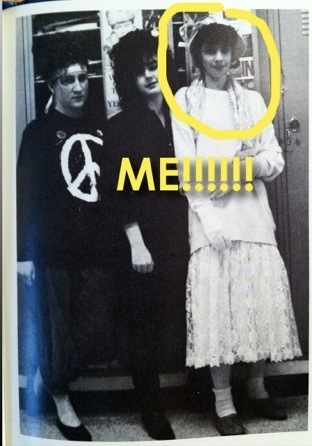 Eileen shared a picture of her high school self with us. Please tell us: What did you do in high school that made you think you were really cool? US/Canada only. Giveaway ends January 22nd at midnight EST. I used to wear flannels from the thrift store and think they were the best ever (hey, it was during grunge)! Well I can sing I was in a band in high school and of the course the boys were very popular so I thought I was pretty cool since I hung out with them and all my friends drooled. they were pretty hot! lol! Glad to find out this author is in my neck from the woods. I follow GFC and now twitter. 1. I had BIG hair! I know most did, but mine was like, really, really, really big. My friends and I would see who could get the most volume/height. Absolutely hideous now but then....we were awesome. Haha! In high school I would put so much gel in my hair and then use my diffuser to get it all curly - we called it "scrunching" our hair. I thought it was the coolest. I was this quiet little thing in high school, and I never thought I was cool at all. I knew I was not cool in high school. I did hang out with an older surfer crowd and cruise Bob's and hang out in Malibu but that did not make me cool at all. I wore a red pants-- once!! In high school I used to drink a lot. I thought that was pretty cool then. I enjoyed the review. This book sounds very interesting. I wore multiple layers or Izods (polo, button down shirt, sweater. What was I (and everyone else) thinking? I don't think I was ever really cool, except I was the principal chair in orchestra. I used to wear my hair long and it would go down over my eyes if I didn't push it back! Can't believe some of the pictures! I was a big dea; in our choir. Ha. It was so much fun and I miss it. Only a handful of us who made the advanced choir really know how awesome it was.